The global tobacco epidemic kills nearly 6 million people each year, of which more than 600,000 are non-smokers dying from breathing second-hand smoke. Unless we act, the epidemic will kill more than 8 million people every year by 2030. More than 80% of these preventable deaths will be among people living in low-and middle-income countries. 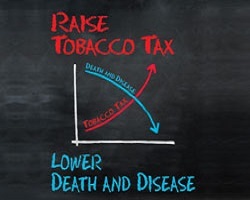 For World No Tobacco Day 2014, WHO and partners call on countries to raise taxes on tobacco. Under the WHO Framework Convention on Tobacco Control (WHO FCTC), countries should implement tax and price policies on tobacco products as a way to reduce tobacco consumption. Research shows that higher taxes are especially effective in reducing tobacco use among lower-income groups and in preventing young people from starting to smoke. A tax increase that increases tobacco prices by 10% decreases tobacco consumption by about 4% in high-income countries and by up to 8% in most low- and middle-income countries. Furthermore, increasing excise taxes on tobacco is considered to be the most cost-effective tobacco control measure. The World Health Report 2010 indicated that a 50% increase in tobacco excise taxes would generate a little more than US$ 1.4 billion in additional funds in 22 low-income countries. If allocated to health, government health spending in these countries could increase by up to 50%. The ultimate goal of World No Tobacco Day is to contribute to protecting present and future generations not only from the devastating health consequences due to tobacco, but also from the social, environmental and economic scourges of tobacco use and exposure to tobacco smoke.